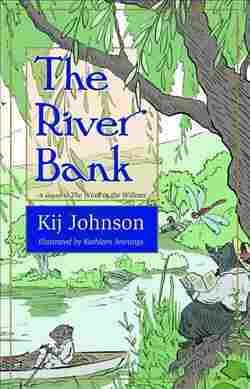 The Wind Still Blows Through The Willows — And Along 'The River Bank' Kij Johnson works fresh magic with an old story in The River Bank, a sequel to The Wind in the Willows that introduces two new characters, Miss Mole and Miss Rabbit, but keeps the original's charm. Amal El-Mohtar is the Hugo Award-winning author of The Honey Month and the editor of Goblin Fruit, an online poetry magazine. Fan fiction — fiction written by fans of a given intellectual property, set in that property's world — is frequently disparaged as self-indulgent, amateurish, immature and derivative. To call someone's original work "fan fiction" is, likewise, to denigrate it. This is a shame, because I've read fiercely beautiful, accomplished, insightful work that is absolutely fan fiction — work which, were it acknowledged as fan fiction more regularly, could go a long way towards rehabilitating the practice of imagining oneself into one's favorite worlds, foregrounding their backgrounds, and asking of them "what if?" Wide Sargasso Sea is fan fiction about Jane Eyre; Clueless is fan fiction about Emma — and Kij Johnson's The River Bank is fan fiction about Kenneth Grahame's The Wind in the Willows. The River Bank is set a year after the events of The Wind in the Willows, and takes up its familiar, much-beloved characters in their natural summertime habitats and occupations: Mole and Rat go boating, Badger keeps the Weasels and Stoats in line, and all are beleaguered by their periodically reformed friend Toad of Toad Hall. But two new people have arrived at the River Bank, taking up residence in Sunflower Cottage, a Miss Mole and a Miss Rabbit. While most of the River Bank's denizens welcome the new arrivals, Mr. Mole regards them with grumpy suspicion. In particular, he shuns Miss Mole completely, and seems to have some previous acquaintance with her of which he refuses to speak. But when Toad — innocently encouraged by Miss Rabbit — conceives a new, disastrous passion for motorcycles, all manner of incident, consequence, shambles and shenanigans ensue, forcing the Moles to put aside their differences — and similarities — in order to help. 'The River Bank' is fan fiction about 'The Wind in the Willows.' This is a feature, not a bug. I was never less than delighted with this book. From beginning to end, it thoroughly charmed and engaged me, speaking the native literary language of my childhood. Like a river, it is in places languid and broad, in others narrow and rushing, the story spilling over sharp rocks of incident before pooling in afternoon sunshine, smelling of lilies and mud. I loved the sweetness of its pace, which spoke of a deep, abiding love not so much for the source material's specific contents as their tone: a wistful, enchanted melancholy that walks hand in hand with summer's end. There are passages here that I treasure, that take up the timbre of Kenneth Grahame's voice to speak of new things that feel timeless: the joys and pains of being an author at work; the changeability of a summer's day from possibility to exhaustion; the quiet loneliness of a home half-dwelt in, a home asleep until woken by occupation, activity, presence. Sentences like "an animal lives in the long now of the world." So much of this book dwells deeply in that long now. In addition to its many native felicities, the text is embellished by Kathleen Jennings' beautiful incidental illustrations, grace notes sounded in E. H. Shepard's mode with a line reminiscent of Beatrix Potter and a sensibility all Jennings' own. Fan fiction is so often written from a place of hunger, a desire to plant something of ourselves between a story's lines to see what crop will grow. Given The River Bank — not to mention The Dream-Quest of Vellitt Boe, which riffed on a classic H.P. Lovecraft story — I find myself hoping Johnson will transform more of her childhood reading, and knead more old literary dough into warm new bread. A previous version of this story misspelled Vellitt as Vellit in a book title.